Kyla's memory has been erased, her personality wiped blank, her memories lost forever. 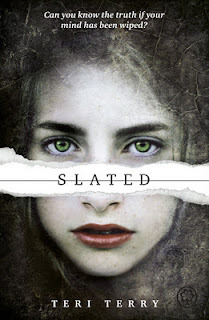 Slated is an original YA dystopian read which is brilliantly engaging and absorbing read which I thoroughly enjoyed. I loved the concept for this book. The society it is set in has found a new way of dealing with criminal teenagers. They are slated and given a fresh start with a new family and new home with no memories of what they have done in their past. I loved the idea of the world Kyla found herself in. She has no idea who she was, what she did and has to start from fresh. The thing that makes her different from other slated is that she starts to know somewhere in the back of her mind that everything isn't what it seems like. She starts to question about the whole system and what is actually happening and why teenagers are actually getting slated due to the strange dreams she is having and the fact that others in her school are going missing. I loved Kyla as a character. She has this real spirit about her and knows somewhere in the back of her mind that everything isn't what she's been told. Her relationship with her slated sister is really interesting and sweet and I love how she relates to the other people she meets because in many ways she very much is an innocent child. Her reaction when she finds out more from her friend who is working to find out about the system is brilliant as she is torn between wanting to know more and not knowing whether it is wise for her to know more. The law enforcement system in this book - The Lorders - are really creepy. They are only seen on the sidelines and are very much a creepy presence whenever they are on scene in a very much 1984/gestapo kind of way. They sweep in and take people away who don't play by their rules without explanation which makes it even more creepy. The story sets up so many different strands which are begging to be explored. The only thing I didn't like about this book was that the ending was a huge cliff-hanger and has left me desperate for more. I don't know if I can be patient enough to wait for next year.